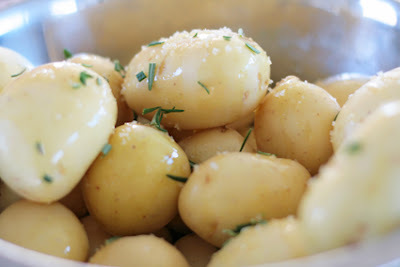 In a large mixing bowl, add the whole potatoes, garlic cloves, olive oil, rosemary, salt and pepper. 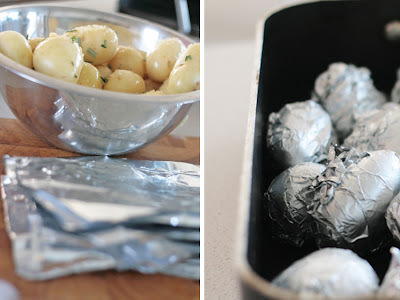 Mix thoroughly (hands work best) until the potatoes are coated evenly with the oil and spices. Wrap each potato individually and place on a baking tray. Check after about 20 minutes or so & shake the pan to turn. Cook for about another 20 mins or so. Transfer to a serving bowl, mix with butter. Sprinkle with parsley or fresh thyme / salt if so desired and serve.